Forklifts are used in warehouses to move large loads, load shipping containers and unload delivery trucks. They have the capability to lift pallets of material and place them in storage locations to maximize the vertical dimension of a room. 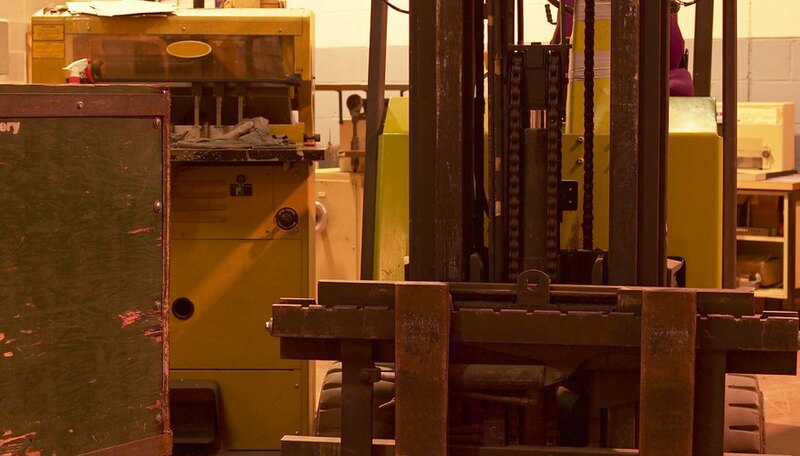 For a forklift to lift large loads, a counterweight is often used to shift the center of gravity of the vehicle to accommodate heavy loads or high placement. Removing a counterweight from a forklift requires the use of another forklift or winch to lift the weight off its location on the forklift and place it in a location to store it. Many counterweights weigh between 3,000 and 5,000 lbs. Locate the counterweight on the forklift. The counterweight will be located in the front, in the back or at the center point of the forklift. Once you have located the counterweight, find the mounting bolts or pins that attach the counterweight to the forklift. Attach an overhead winch or forklift to the top of the counterweight with a chain. Lift the counterweight using the winch or forklift to take the weight off the mounting bolts. Remove the mounting bolts or pins with a wrench. Lift the counterweight another few inches and, if you are using a forklift, drive it out from under the counterweight. Move the counterweight to a storage location and lower it to the floor. Re-attach the mounting bolts and pins to the counterweight.